Dembi Dollo, Ethiopia is home to over 40,000 people, the majority live in exceedingly poor conditions; dark mud houses without beds or running water. But Dembi Dollo is also home to our Abdi Academy School where we educate over 400 of the poorest children in the community and provide regular food, healthcare and family support programmes. 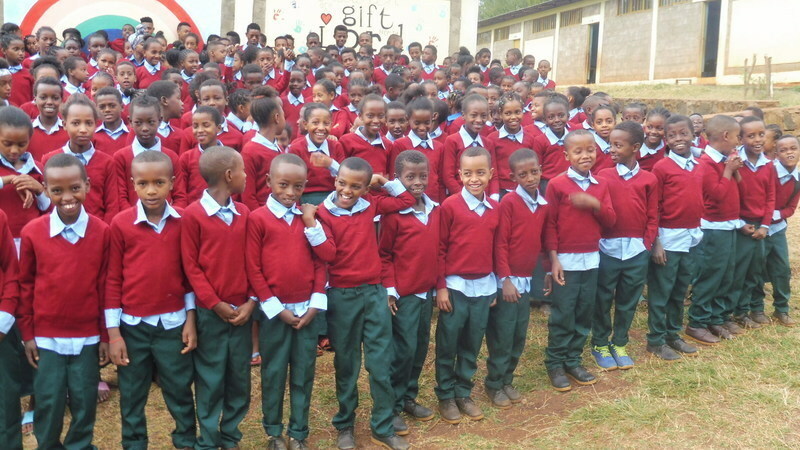 Our kids in Dembi Dollo are energetic and have an eagerness to learn but their families do not have adequate income to afford everyday items such as new clothes and school uniforms. As our kids run and play, their clothes quickly become scruffy and worn out. It’s incredibly important to us that our children feel dignified and proud of their appearance. That’s why we provide our children around the world with new uniforms and our kids in Dembi Dollo recently received theirs. The bright new uniforms have replaced their worn out clothes and our kids are now beaming with pride and looking smart. The uniforms have increased our children’s self-worth and confidence and their smiles show how happy they are to have good quality clothes. When our kids feel good about themselves they are more enthusiastic to learn. Thank you to all of our supporters who help us provide uniforms for our children, they are essential for their wellbeing and sense of belonging. With new uniforms and a great school to attend, our kids can make the most of their opportunity of an education.